Here is a brief overview of the basic set up and operation of drum brakes. I’ve had a couple of requests for this one and I’m happy to address those questions here. I will be making a longer version of this video that will eventually be for sale on the ETCG website. 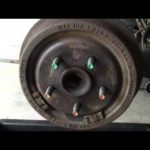 This video will not only cover the operation but it will also cover brake shoe replacement. As always you can visit me at EricTheCarGuy.com which is now slightly smaller for those of you with smaller viewing screens.